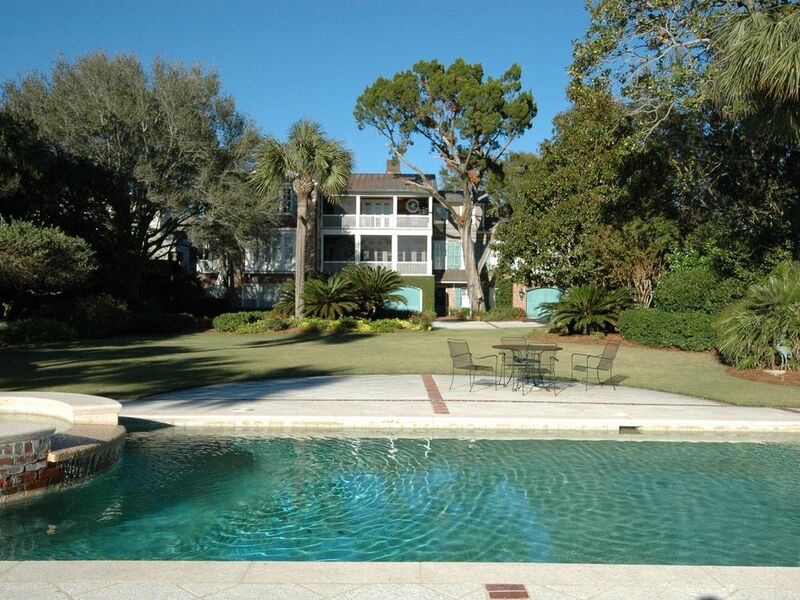 Treat yourself to THE VERY BEST RENTAL PROPERTY on St. Simons Island for your next beach vacation. Unsurpassed in its luxury, size, and convenience of location, the east gate of our oceanfront compound is merely 150 feet from the pier village, but once relaxing inside the walls of this spectacular estate, with dolphins splashing about and ships steaming by, you may not want to leave the property. From our vista on the south end of St. Simons Island, Jekyll and Cumberland Islands are immediately across the sound, with the Atlantic Ocean and Sidney Lanier Bridge on your left and right, all of which is visible from every room in the house. The village is packed with restaurants, shops, and popular watering holes, leaving our guests with virtually no need to travel by car once here. St. Simons boasts a newly renovated oceanfront park, complete with water park style pool and miniature golf course, as well as a maritime museum at the foot of our historic lighthouse. Itylldoo is the perfect spot for a luxurious getaway, family vacation, small event, or corporate retreat. Everyone that we have hosted has been pleasantly surprised by the size of the property and quality of its furnishings. The estate grounds are shockingly large to be on the beach, with a 5,000 square foot bermuda grass lawn adjacent to the pool, which has been used for everything from a volleyball court to a putting green. Whether you prefer to spend your time here soaking in the sun by the pool, surf fishing with the provided tackle, or pampering yourself in the spa style fitness center, Itylldoo is the perfect venue for an unforgettable vacation. 8 Flat Screen TVs, Chef's Kitchen, 3 laundry Stations, Jetted Tubs, Large outdoor pool and Hot Tub, Elevator, Full Work Out Area, Large Steam Room, Outdoor Grill, Flowers and Foliage indoors, Pool and Beach Toys, Floats. Loved being close to town and property was great for mixed ages and large family stay. Wonderful family reunion home in the heart of St Simon's Pier Village. Beautiful oceanfront estate filled with eclectic art and perfect for a family reunion. We enjoyed the location close to the Pier Village. Walking & bicycling on the beach and on bike paths all over the island. Close to restaurants & shopping. A fantastic Coastal Georgia home. Everything about this house was perfect!! Our entire group of family and friends had a wonderful time and we all made lastly memories. 100% would recommend this house! One of the Best Vacations! We truly enjoyed this home. It was a wonderful, convenient location on SSI. Purple Dog Rentals communicated perfectly with us. We had 11 people and had plenty of room. House had everything we needed. Stocked kitchen, plenty of towels, and space. Lovely property that we would definitely stay at again. Owner, Jane, was very sweet and hospitable. Enjoyed her history on her artwork. Itylldoo is an understatement. We celebrated our son’s wedding in SSI over Memorial Day and this house allowed our family and friends to spend the entire weekend together with room to spare. Having the deck overlooking the water allowed for quiet, much needed moments in a whirlwind weekend of activity. The pool also allowed the bride and groom an afternoon of leisure after the final guests had left. I look forward to staying here again in the future!! Beautiful home and lovely yard. Our family of 10 had plenty of room. Management very helpful. We all had a wonderful experience at ‘Itlldoo’. A very big and lovely home. Location is ideal, a short walk to everything in the village. Pool was wonderful but no swimming at the beach in front of house due to ocean current of the shipping lane. We did enjoy seeing the many ships go by however. Great restaurants all within walking distance. Thanks for the nice review. I do have to clarify one point. You can certainly swim in the ocean here. The "shipping lane" reference is confusing and not accurate. I see people swimming and playing in the ocean here at low tide most of the days during warm weather.